Ariane and Sophie are happy to welcome you all year around, as individuals or in groups, to their Auvergnat gite/hostel, which is situated in a hamlet in the middle of the mountains at an altitude of 875 metres. The road ends here and is replaced by tracks in the D’Ayguebonne forest, which is credited with the Natura 2000 award. You are now in the park of the Livradois Forez at the foot of Grun de Chignore which is an area of particular ecological interest due to its flora and fauna. You will find yourself surrounded by nature’s bio diversity. A time to walk, relax and be rejuvenated. 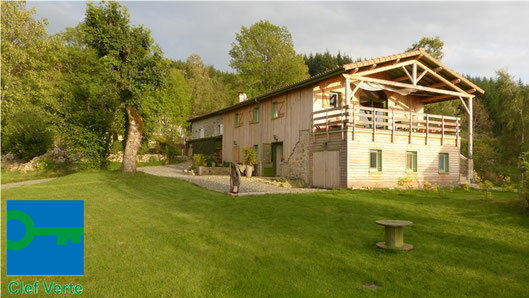 This completely renovated ECOGITE can accommodate 12 people and has been awarded 3 Epis by Gite de France. It also has the advantage of a licence enabling the option of half board. The construction and operation of our project has been guided by a programme of sustainable development to which we have subscribed. We wish to share our way of life with you, with low energy consumption and a collaborative economy (sharing, short tours, exchanging and co-operation). This special location is particularly suited for workshops, training sessions and seminars. European eco label and Clé Verte having met all the exacting criteria required. Our motto is "Simplicity, Authenticity and Conviviality" and quality is our ambition.